Why Orlando Florida's Fashion Conscious Well Heeled Nike Galaxy One Idiots Should Have Been Storming The Barnes & Noble Book Store Instead! I just got in from running a few errands earlier than usual for my Friday schedule and realized that upon returning that i forgot to turn off the television. To make matters worse I really do not ever watch television unless there is something of interest on the news and even then it would have to be something of an immense magnitude to cause me to offer my consciousness to the engineered mind altering airwaves. But I did plan on watching the weather channel before leaving the house if my memory serves me correctly but I guess it wasn’t as important to me as I thought it would be because I left my home and paid it no mind by leaving it on. But I am kind of glad that I did leave it on, because as soon as I entered my premises, a story was in progress speaking on an incident at the Florida Mall here in Orlando Florida that involved hundreds of aggressive and violent shoppers who were hellbent on purchasing the limited-edition Nike Air Foamposite One “Galaxy” shoes! I couldn’t believe the footage of what had transpired and really what I was seeing with my own eyes! While there were shoppers of all ages and races there if you looked hard enough, it was predominantly a young Black and Latino crowd that were there to scoop up a shoe that cost approximately $220.00 dollars and from what I read could have been resold on the internet for over ten times that price because it is a limited edition offering. What is wrong with this picture people? Well I happen to know this particular part of town and I do also happen to know that there is a Barnes & Noble bookstore across the street on the adjacent side of Orange Blossom Trail. Well as one who works with the public in the dirty underbelly of Orlando every single evening, I know for a fact that our youth and young adults are so far behind where they should be scholastically when compared to those who excel that dwell in other communities. So now we have these same youth who are setting records for teen pregnancies, juvenile arrests, illiteracy, crimes, drug use, sales and abuse, random violent incidents and just about leading the category of everything that they should NOT be doing storming a store for a pair of EXPENSIVE sneakers when in fact they should be storming the book store across the street in order to gain the precious knowledge that will steer them to a better life long after that same pair of athletic shoes are old, dusty and out of style. I’m very glad that they canceled the sale of these Nike Galaxy One “shoes” because if they didn’t, you would have to ask yourself how many people would have died over a envious gun toting individual who coveted them for themselves? We truly have become animals! But understand that books are too corny and out of style these days and don’t seem to hold a cherished place like it did when I was younger and coming up like these young buffoons. I will tell you this – while I never took the time to apply myself in order to attain a college degree, I do know the value of absorbing knowledge and improving one’s life through continually reading to elevate your mind to put yourself in a better position to excel. So while those expensive shoes may look good now, know that an accomplishment on a scholastic level NEVER goes out of style! …….and while there are many who would argue that a college degree isn’t worth its weight in toilet tissue these days I will say that you’ve NEVER heard of one ever having an expiration date now have you? If the truth be told has there ever been anyone who was elevated in this life in the manner that a quality education does because of the style of show that they wear? Stop this superficial foolishness that you are indulging in because in this world at this present time we as a society are at one of the most crucial junction points in recent history as we must remain cognizant of our personal financial decisions because we can still take a turn for the worst economically and find ourselves in a sorry state of affairs overnight! This insane mentality reminds me of the flamboyance that was so widespread just before the recent recession that we have all seemed to have forgotten……. The perception of abundance was intoxicating! It seemed as though everyone qualified for a mortgage to move into a mini mansion or could walk into any auto dealership and pick the car of their dreams and drive off of the lot after signing the dotted line with no money down! In the ‘hood it seemed like every cheap economy car had flamboyant rims, every ghetto mouth had gold caps over rotten teeth and every hoochie mama had an expensive weave costing the equivalent of one of my paychecks on a head that didn’t even contain an ounce of damn sense or a modicum of education! But when the party was over and the bubble burst, that weave did nothing for the idiot who thought she (Or he, let’s not forget those!) was elevating her status by slapping on some horse hair on her head, or that thug that now has a major toothache under those gold teeth but doesn’t have the money or legal income stream to see the dentist or that guy who proudly blasted his music at the red light to bring attention to the expensive chrome rims that now double as a seat in his garage collecting dust. So here we go again as though we didn’t learn our lesson. It’s sad but true that some of us will be perpetual idiots who will always be followers and never utilize the gift of a free thinking mind to truly rise above the fray of consumerism to release the oppressive shackles that we allow to be placed on ourselves because of our failure to see beyond the temporary thrill of the brief sense of perceived status that comes from a damn shoe. Are you “effing” kidding me? So there you have it, a very public report card on the status of our collective mentalities. And corporate America stands to benefit once again from the young well trained media indoctrinated “sheeple” that we have become who will spring money that they don’t have for a book yet will risk life and limb for something that you merely place your foot in. And with our antics being broadcast live all over the world instantaneously, you wonder why all of the foreigners who come here to these shores with absolutely nothing but the shirt on there backs give us no respect and rise up fast to excel in a place where we should have succeeded a long long time ago. 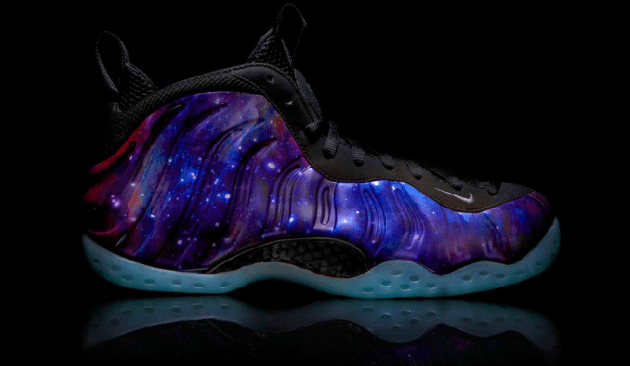 Limited-edition Nike Air Foamposite One “Galaxy” shoes? They should rid the world of Black History Month because it seems to be one big waste of time when you see where the real enthusiasm and focus really is. Just tell them that they are stupid idiots who produce nothing and are good for nothing except to indulge in the reckless hedonistic activities that result in them making babies that they don’t take care of, stealing because they do not want to earn there desires fairly and fall into a life of crime where they blame “The White Man” for their every literal “EF” up decision under the sun. But as long as they can wear the latest designer clothing, sneakers and have the latest smartphones, to tell them that would not bother them one bit! So after seeing what I saw in the news today I am through and have given up defending a foolish people who have no idea how they should be living righteously and in accordance with scripture. Please, the Lord has given us three score and ten to be here if we are so blessed to get that far. I have screamed out enough through my work here online but am getting weary when I see that the world is getting worse. So please let me live out my years in peace and quiet even if the world wants to take itself to hell, feel free to do it, just don’t expect me to come with you. Now let me happily go to fetch my old worn down holy WalMart brand cheap sneakers and allow me to relax with a nice book. Previous : Whitney Houston’s Mysterious In House Backstabbing Judas Turns A Profit With Those National Enquirer Coffin Photos! Next : The LanceScurv Talk Show – Abusive Predatory Controlling Men & The Women Who Love Them!